Anime Expo 2018 has now wrapped up and the last remaining panels were dedicated to some of the book distributors! But along the way they offered a wide range of new manga and novel announcements! These were all revealed during their industry panels. Seven Seas have revealed a bunch of announcements at the last minute but they went all out surprising fans with a couple highly requested titles in the mix! A spin-off story centred around Hokaze Junko, the second-in-command of Shokuhou Misaki’s faction. Hokaze meets a ghost after helping Shirai Kuroko and the two eventually become friends. Licht Sajo is an honor student with perfect scores in every subject on his high school entrance exam. Hikaru Kusakabe plays guitar in his band that performs at live events and is popular among the girls. These boys would have never crossed paths. But one day Hikaru offers to help Licht prepare for their upcoming chorus festival and the two begin to talk. As the two meet after school, they bond through songs and begin to harmonize as their hearts beat together. It starts out slowly but soon their feelings for one another grow and suddenly they both realize that they are in love. Hikaru’s emotions are frivolous, pure and direct causing Licht to hesitate at first, but he gradually opens his heart. The boys learn about each other, as well as themselves, as they support one another during this difficult time in their youth. It’s been 10 years since the appearance of mankind’s natural enemy, the Jaive. As a result, human territory has narrowed considerably. But humans can fight back using the Division Maneuver weapons. The protagonist attends a school that trains budding warriors, but operates Division 1, the weapon with the lowest magical power. This story acts as a sequel to the original Dragon Quest Monsters game for the Gameboy. Kurio, a child who wishes to be a hero, is thrown to a world where monsters are found all over, and is asked to become their new Monster Master hero since the great tree is withering, the monsters are going berserk, and Terry, the previous monster master, has gone missing. Shards of memory with a brilliant radiance. As the seasons turn, two boys’ hearts are changing. Winter brings them close to each other, little by little. The spin-off series to Miss Kobayashi’s Dragon Maid focusing on the daily life of Elma, one of the dragons in the series. Now gifted with a tremendous amount of magical power as well as the mind of a grown adult, Rudeus is seen as a genius in the making by his new parents. Soon, he finds himself studying under powerful warriors, such as his swordsman father and a mage named Roxy Migurdia – all in order to hone his apparent talents. But despite his innocent exterior, Rudeus is still a perverted otaku, who uses his wealth of knowledge to make moves on women whom he could never make in his previous life. Sorcerous Stabber Orphen Heed My Call, Beast! Sorcerer Orphen’s quiet life is interrupted by the advent of both an apprentice and a young woman with a sword he needs. A love triangle between Ichika and her two childhood friends Ritsu and Shun. The classic manga series that serialised in 1985-1994 is coming back in print under Viz Media’s Shojo Beat label, just in time for the anime adaptation to begin airing in the Summer 2018 season. Viz Media initially released all 19 volumes between 2004-2006. The brand new one-shot from the creator of Bleach is coming to the English version of Weekly Shonen Jump on 16th July 2018. The fourth part in the JoJo’s Bizarre Adventure series is finally making its way to the west with an official English translation. The 18 volume series will be released in 2-in-1 omnibus volumes. Viz Media continues to bring more Junji Ito stories to the west with the Shin Yami no Koe collection featuring ‘Smashed’ which was adapted in the Junji Ito Collection anime series. Yen Press’ industry panel was running at the same time as Seven Seas so we have a bunch of new announcements occurring together. All of the novel titles will be released under the Yen On imprint with the manga under the main Yen Press imprint. The Republic of San Magnolia has been attacked by its neighbor, the Empire. Outside the 85 districts of the Republic there is the ‘non-existent 86th district,’ where young men and women continue to fight. Sheen directs the actions of young suicide bombers, while Lena is a “curator” who commands a detachment from a remote rear. The story of the tragic struggle between these two begins! The light novel adaptation of the popular Bungō Stray Dogs manga is coming! This story focuses on the past of Dazai Osamu before he joined the Armed Detective Company. The Mizuki Diving Club has fallen on hard times, and their sponsors are ready to pull their support. They promise to give the club another year of sponsorship if new coach, Kayoko Asaki, can get a member into the Olympics in one year! Satou Matsuzaka has someone she likes. She thinks it must be love, and everything will be forgiven so long as she protects this feeling, even if she tricks, steals, or even kills for it. One year before Yumeko transferred to Hyakkaou Academy, Saotome Meari passed her transfer examinations. A girl from an ordinary family, her new school has a crazy law of the Baptism of Gambling! Paired with Yumeko as her ‘twin,’ Meari’s story of gambling mania begins! Kun, a spoiled 4-year-old boy, comes across a magical garden where he meets his future sister, Mirai, who is now a young woman and has traveled back in time to see him. Their adventures together help Kun cope with learning how to live with a baby sibling. In a world where humans and monster people co-exist, Monster Wrestling is the most popular sport. When Chirol, a novice Cerberus wrestler, is approached by the world’s largest wrestling organization, her competitive life finally begins to move forward. On a mysterious night that seems to last a year, an ordinary college student continues to chase one of the underclassmen, a girl with black hair – the girl of his dreams. Up until now, he has been relying on a simple plan, bumping into her every day while making it seem like a meaningful coincidence. This story depicts stray cats as yankees, ready to fight on the treacherous streets of the city! Fourth-grader Aoyama investigates the mysterious reason behind the sudden appearance of penguins in his village. Is it somehow related to the power of a young woman working at a dental clinic? It’s the year 305 of the Alcian calendar, and the world is controlled by numbers. Every human born is branded with a “Count,” which could mean anything from the number of kilometers walked to the amount of people who have said your food is tasty. And if your Count drops to 0… you’ll be sent into the Abyss! After Hina’s mother’s Count dropped to 0, her last request is for Hina to look for the Legendary Red Baron. Oogami Routa, a corporate slave who died from working too much, wishes he could be the dog of a rich household…and has his wish granted by an enthusiastic rookie goddess! But isn’t he a little too big for a dog?! One rainy night, five-year-old Senri’s parents fell victim to a murderer, and his twin brother went missing. Now a high school student, all he can think of is revenge. With the culprit’s scar his only clue, he will do everything to end the life of the one who destroyed his family. And that’s all of the Anime Expo 2018 announcements when it comes to books! Hope you all are looking forward to what was announced from J-Novel Club and Dark Horse, Kodansha Comics & Vertical earlier. Woof Woof Story: I Told You to Turn Me Into a Pampered Pooch, not Fenrir! 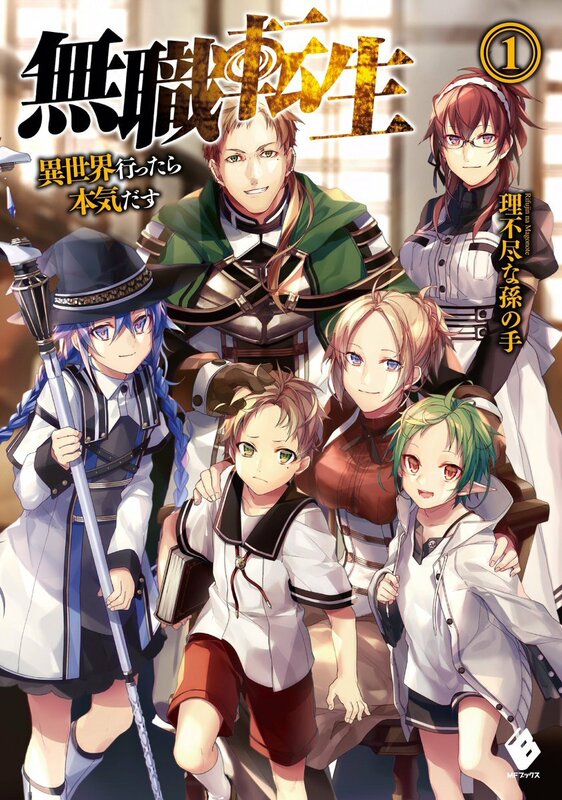 is a fun endeavour in the isekai genre. It’s not offering anything new but if you’re fond of canines and fantasy adventures, this might be an enjoyable read. 86 Volume 1 is a superb book which offers a thought-provoking, emotional read which proves incredibly difficult to put down. It’s a perfect start to what I hope will be a great series.